George Harrison and the other Beatles travelled to India as part of their own quest for spiritual fulfillment. In 1965, Krishna consciousness spread from India to the West when His Divine Grace AC Bhaktivedanta Swami Prabhupada founded a world-wide society of over one hundred temples, farm communities and schools to teach Hare Krishna followers about vegetarianism, non violence, yoga, meditation, the vedic scriptures, and the path to bliss (ananda) which is achieved by repeated chanting in praise of the Lord Krishna. 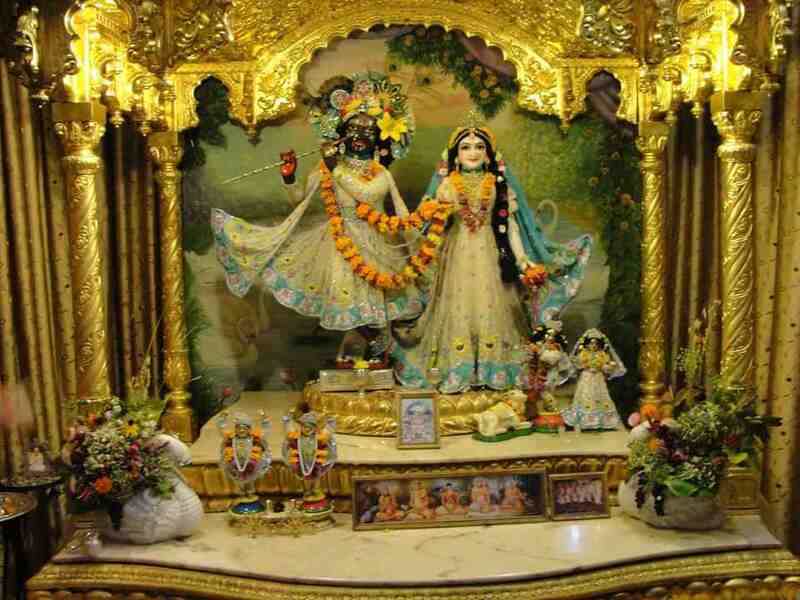 There are just two Hare Krishna communities in Northern Ireland, one in Belfast and the other in County Fermanagh. On a calm autumn Sunday morning, we drive through leafy lanes leading off from the main Derrylin to Lisnaskea road to the Krishna Quay on Upper Lough Erne. We are joined by Hare Krishna followers on the ferry to Inish Rath Island, where the Hare Krishna Centre was established in 1985. From the quayside, age old trees and foliage give no clue to the peaceful island settlement hidden from view. Upon arrival, one is surprised to discover an impressive Victorian mansion, built in 1854 by Cavendish Butler, which later became a hunting lodge owned by Lord Erne. In 1939, the island, which includes a twenty two acre nature reserve stocked with stags and deer, peacocks and peahens, was purchased by Baronness Schoenart, a Polish lady who in turn sold it to the newspaper barons, the Morton family. At the height of The Troubles, in 1982, property prices slumped in this border area. A group of Hare Krishna monks, led by a German follower, Prithu Das, pooled their resources and took out a bank loan to buy Inish Rath, a perfect setting for a Hare Krishna centre. The Hare Krishna temple was established in the west wing of the house with a magnificent golden altar at one end of the long room and a life size representation of Swami Prabhupada at the other. Oriental arches frame the windows and polished pine floors add to the overall feeling of light and space. A powerful scent of incense envelopes us as we enter the temple. A lone Indian devotee sits cross-legged on the floor, playing oriental cadences on a violin, which he holds in an unusual position against his chest, rather than his chin. In an atmosphere of peace and tranquillity, the curtains are drawn on the glittering altarpiece and the kneeling Hare Krishna worshippers press their foreheads to the ground as a mark of humble respect for their Lord Krishna. The Bhajana band provide the music as the temple President leads the service, which begins with repeated chanting of Lord Krishna`s name. The leader himself plays the accordion, while his son beats the mrdanga drum. Another devotee sits at the harmonium, the small bellow powered keyboard which the British took to India instead of the organ. Other members play kartala cymbals and flutes. As the chanting gains momentum, devotees get to their feet, dancing to a trance inducing rhythm. 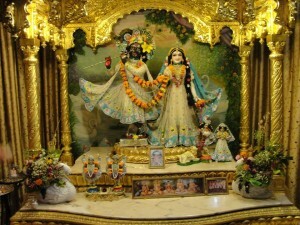 A sari-clad female stands in the inner sanctum beyond the wrought iron altar gates making offerings of fire, water, incense, and flowers to the twin forms of Krishna, who has a black face, and his other half, the female Radha. As part of the purifying ritual, a server then passes the fire around in an amphor, so that each Hare Krishna follower can receive the purifying flame. Purified water is also poured over their heads. Individuals are free to approach the altar with a lighted candle to make their personal supplications and prayers. Finally the altar is carefully swept, cleaned by the attendant and the curtains are drawn once more. 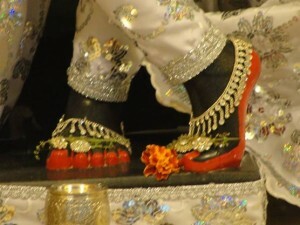 Passages are read from the Bhagavad Gita, underlining basic Hare Krishna principles, such as humility and chastity. The resident monks who tend the temple wear saffron robes, a sign that they are unmarried. As keepers of the Temple, they follow a stringent regime of daily worship, which begins at 2am, when a nominated monk draws the altar curtains. 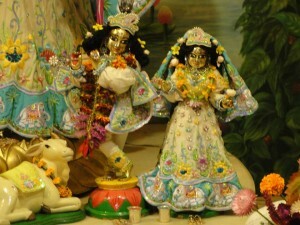 At 3am the server wakes the Radha and Krishna deities and offers them some food. From 4.30 to 5am, incense, fire, water, handkerchief and flower offerings are blessed until finally all of the monks assemble for the first devotions of the day. Hare Krishna families live on the mainland near Inish Rath, while regular visitors usually arrive for Sunday worship. An Irish lady with a Krishna name, Murli Priya, her Ukrainian husband, Haridas, and their daughter Lalita travel up for the day from Carrick-on-Shannon. The couple met at the Hare Krishna cultural centre in Dublin. Tim McEvitt and his Panamanian wife Carmen met through a Vedic centre on the internet. They brought their two week old baby to the temple. Indian doctors practising at the local Fermanagh hospital or IT experts working in the new ‘tiger economy’ in southern Ireland have also contributed to the community. In an effort to promote eco tourism, the centre offers weekend breaks that include yoga or vegetarian cookery classes. A recent attraction was the visit of the Australian vegetarian guru and TV cook, Kurma Dasa. Aware of the need to promote cultural diversity, the local Fermanagh Council have supported Hare Krishna open days on the Island and offered a grant for the building of a row of eco toilets. The centre has also applied for Lottery funding. The Sunday worship ends in the dining room with a magnificent Krishna Feast, a wholesome array of vegetarian dishes including subji, curry, dahl, pakora, rice, chapatis, samosas, halva and sweet rice cooked by the weekend cookery class. The island of Inisrath was formed towards the end of the last ice age more than 10,000 years ago. The pressure of the ice followed by the retreating ice as the Ice Age ended carved into the landscape and produced Lough Erne, Inisrath and the neighbouring islands. According to local historical references, there is some evidence that there was a ‘rath’ on Inisrath, perhaps 2000 years ago. This was a fortified homestead of an extended family with a chieftain at its head. A rath on the island offered extra protection from wolves and other aggressors, such as cattle-raiders. Through history after this early period we do not know if Inisrath was inhabited or not. The next events that we are aware of is that the island was apparently part of the lands of Lord Erne. In the mid-19th century his daughter was married to Sir Henry Cavendish Butler, and Lord Erne gifted Inisrath to his son-in-law. Sir Henry built the existing house at this time during the Victorian period. For most of this time into the early 20th century Inisrath House was used as a pleasure house or Summer house for the gentry. They would gather on the lawns, have parties and functions, go yachting and boating on the lake and apparently enjoy life! However, during the first world and then the second world war many of the local gentry charged off to fight… and were killed. This ended the period of ‘Upper Class’ society on Lough Erne. The house remained in the Cavendish Butler family for a 100 years, and then in the 1950′s was sold. The island went through continuous change of ownership for about 30 years, where a family would buy, own for 3 – 8 years and then sell on again. And then the island that originally was the property of Lord Erne came into the hands of Lord Krishna! 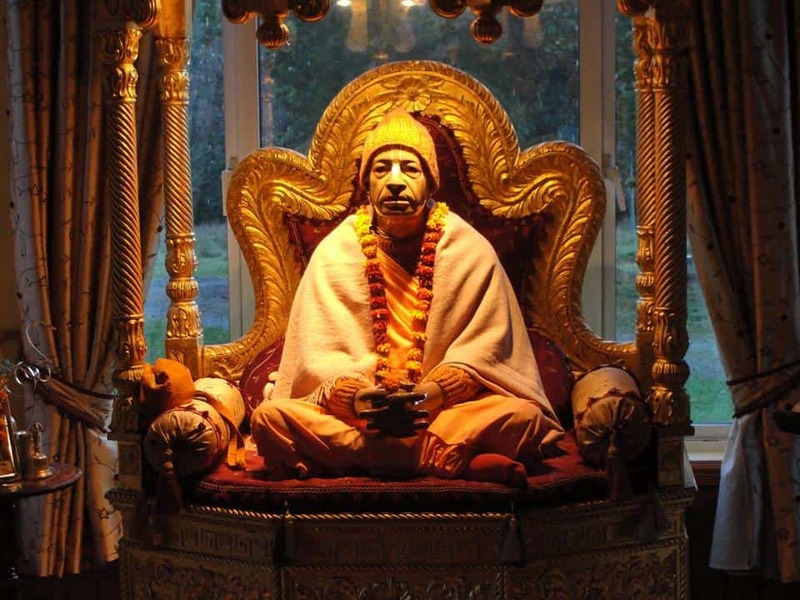 ISKCON NI, the Hare Krishna Society, purchased the island in November 1984, and converted the House to a temple and ashram which was formally opened as such on July 20th 1986. Address: Hare Krishna Temple, Krishna Island, Derrylin, Co Fermanagh BT92 9GN.